Take the first step to identifying the gaps in your succession strategy. After five minutes, and these 13 questions, you’ll see how you stack up. 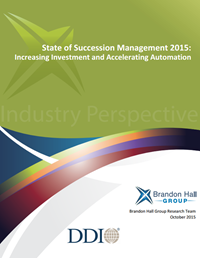 With your results, you'll receive Brandon Hall's State of Succession Management 2015 for access to their top findings on succession management. Our organization will have no trouble expanding or growing because of a shortage of management talent. We run effective global talent pools and are able to supply potential leaders at the right stage in their development to key parts of the business. Senior management is involved in selecting high potentials. The assessment of potential is based on multiple points of view. High-potential individuals are selected based on merit, not on who they know or what group they belong to. The diagnosis of individuals’ development needs is thorough and predictive. We assess leaders consistently around the world and across business units. We gain valuable intelligence about leaders that helps us make good decisions about who is ready for roles. Leaders receive insights from assessments or 360º feedback. We differentially focus our development resources on the highest-potential people. Development plans are made to address an individual’s major competency and knowledge gaps. Development transforms leader’s behavior and is worth the investment. Individual development plans use a variety of methods to accelerate development. Almost done! Complete this short form to view your results and access Brandon Hall's State of Succession Management report. Along with your quiz results you'll also receive Brandon Hall's State of Succession Management 2015.